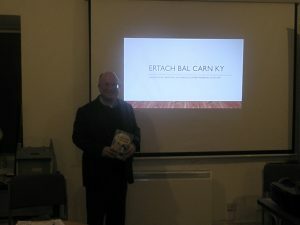 On 10th November at Murdoch House, Redruth Agan Tavas member Ian Jackson gave a talk in Cornish on the mining history of the countryside around Carnkie. Ian, who is a scholar of languages rather than mining history, had obviously carried out a great deal of research on the subject. This made his talk very interesting and it included some facts which even the locals were unaware of! The opportunity was taken of launching a new conversation dictionary compiled by Ian more details under publications.